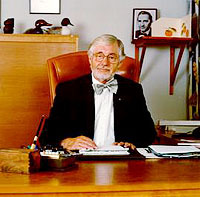 Experiments by Swedish orthopaedics professor Per-Ingvar Branemark indicated that it was difficult to remove titanium surgical pins implanted into the bones of rabbits. The professor discovered that titanium integrates into bone tissue; as such, it is an ideal material for implants. 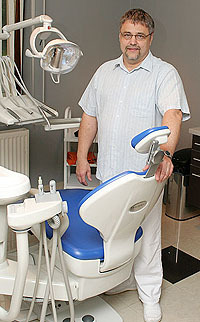 The first titanium dental implants were inserted into a human body in 1965; taxi driver Gösta Larsson used his “new” teeth until his death in 2006 (i.e. for 41 years). Dental implants have become wide-spread in the past 45 years. During that time, both the implants themselves and the related tools and procedures have progressed much. The implant surface is ribbed for better integration into bone tissue. Implants are also threaded; when they are screwed into the bone, they collect bone tissue so that the implant is as stable as possible when it integrates into the bone. The special threading also shortens the healing period. 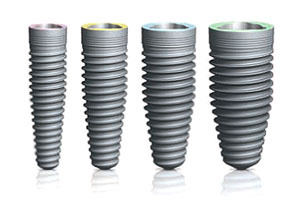 Implants come in a variety of shapes and sizes, so there is one to suit every patient. An implant is actually an artificial tooth root, i.e. it is an invisible part of the complete tooth. The visible (external) part of the artificial tooth is called a crown. An implant can be bonded to a crown in several ways. Some implants are moulded as one piece with the crown. In this case, the type of the crown is pre-determined. Artificial teeth consisting of two or more parts allow for more fine-tuning; various tooth heads can be selected for the given type of the crown or bridge on the implant, and the head can be positioned accurately after implantation.